StepShot Guides is an authoring software built to help users make impressive and comprehensive step-by-step guides, training manuals and instruction materials. It is also an ideal tool for creating technical blog reviews, software workflow presentations and more with no hassle. With StepShot Guides, anyone can easily create smooth and seamless guides and presentations. While useful in the corporate sector, this software is also perfect for other user types that include: bloggers, students, teachers, and training specialists. These professionals who are looking for an easier and quicker way to explain standard procedures and workflows. This authoring and publishing software boasts a hassle-free, user-friendly interface that makes it easy for users to demonstrate or provide instructions using sequences of screenshots. This results in a more comprehensive and understandable delivery of knowledge and better retention for those who are reading/receiving the instruction or information. 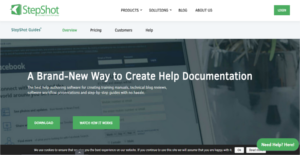 StepShot Guides delivers a user-friendly authoring and documentation software that makes creating guides, reviews, training manuals, and more a breeze. By just clicking your mouse, StepShot Guides takes a screenshot, greatly reducing the time you would normally take if you have to create help files for programs, systems, web applications, etc. Whether you want to capture the whole screen or just take a screenshot of a specific region, StepShot Guides gives you total control on how you want your shots to be. Every screenshot you capture, you can easily add annotations to help make your instructions clearer and easy to understand for your audience. StepShot Guides comes with a comprehensive toolkit that helps you tailor your guides and manuals to meet your industry’s standards and requirements. You can crop parts that are not relevant to your documentation, insert text boxes to your screenshots, or even embed various shapes on your images so you can easily convey your ideas and thoughts to your audience. You can create a user guide from the ground up. Or you can choose to use one of StepShot Guides’ customizable template and then publish your how-to documents or blog reviews or technical articles instantly on WordPress or have it exported as a PDF file. What Problems Will StepShot Guides Solve? Customer onboarding is a demanding procedure for any company. StepShot Guides is a perfect tool for creating step-by-step guides that explain software functionality. It’s convenient to publish them right to the blog or to send directly to customers. Compiling step-by-step instructions to help workers carry out complex routine operations takes so much time. StepShot Guides automates this procedure, effectively speeding up the process. Digital marketers are well aware of what is needed to create an email list in today’s ever-changing corporate world. Nobody is ready to give up their emails and get spammed without receiving anything in return. A lead magnet is virtually the best way to enlarge a number of your prospects’ emails in a short run by creating a viable piece of content that converts. With the help of StepShot Guides, you can create cheat sheets, guides, wallpapers, checklists, guides, reviews, reports, etc. If you are considering StepShot Guides it may also be a good idea to investigate other subcategories of Best Document Creation Software gathered in our base of B2B software reviews. Each company has its own characteristics, and can require a specific Document Creation Software solution that will be designed for their company size, type of customers and employees and even particular niche they support. We advise you don't count on finding an ideal services that is going to work for every business no matter what their history is. It may be a good idea to read a few StepShot Guides reviews first and even then you should remember what the service is intended to do for your business and your workers. Do you require an easy and straightforward solution with just essential features? Will you really make use of the complex tools needed by experts and big enterprises? Are there any particular features that are especially useful for the industry you work in? If you ask yourself these questions it will be much easier to find a trustworthy app that will match your budget. How Much Does StepShot Guides Cost? We realize that when you make a decision to buy Document Creation Software it’s important not only to see how experts evaluate it in their reviews, but also to find out if the real people and companies that buy it are actually satisfied with the product. That’s why we’ve created our behavior-based Customer Satisfaction Algorithm™ that gathers customer reviews, comments and StepShot Guides reviews across a wide range of social media sites. The data is then presented in an easy to digest form showing how many people had positive and negative experience with StepShot Guides. With that information at hand you should be equipped to make an informed buying decision that you won’t regret. What are StepShot Guides pricing details? What integrations are available for StepShot Guides? StepShot Guides integrates with PDF and Wordpress. If you need more information about StepShot Guides or you simply have a question let us know what you need and we’ll forward your request directly to the vendor.